Game of Thrones Star Kit Harington Apologizes To Fans And Reveals How He Kept Jon Snow’s Fate A Secret! [tps_footer]Hollywood actor and Emmy-winning show star Kit Harington brought back everyone’s faith in the fantasy series when his character Jon Snow came back to life. Sunday (May 1, 2016) night’s episode gave the fans what they have been waiting for almost a year. Lord Commander of Night’s Watch Jon Snow was killed in the finale of Season 5 by the brothers of the Night’s Watch. After being provoked by Ser Alliser Thorne, brothers and Thorne stabbed Jon brutally until he dropped dead on the ground. There were a lot of people with tons of theories on how he would be resurrected. While he was shown dead in the first episode, fans still believed that he is coming back. On Ser Davos insistence, Melisandre aka the Red Woman showed the power of her magic and revived Jon Snow. The fans couldn’t be happier. The actor also revealed how difficult it was for him hide this huge secret from cast members too. The death of Jon and revival was written 2 years ago and the showrunners David Benioff and Dan Weiss swore Kit to secrecy that he can’t leak this information to anyone. 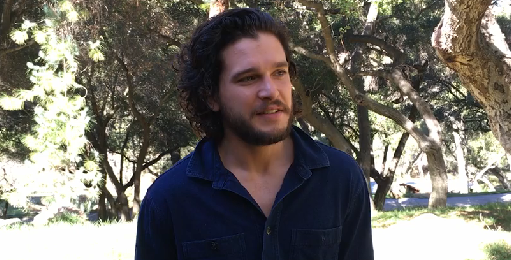 Kit revealed that, at first, he found it funny and convinced everyone that season 5 was indeed his last one. He said that he felt like he was betraying his close friends and cast members after a point. Liam Cunningham who plays Ser Davos refused to believe it but Sophie Turner aka Sansa Stark who plays Jon’s sister was actually convinced. She even wrote him a touching letter stating that she is going to miss working with him. That made Kit laugh a little. Next articleZarina Wahab Speaks Up On Leaving Aditya Pancholi Because Of Kangana Ranaut!